"Generations of men and women have stood on these beaches, listened to water rushing over these basalt rocks, and picked wild blueberries here well before I sailed into the Bayfield harbor. The families of those men and women are still here, tethered to a place where they can slip behind their ancestor’s eyes and take in essentially the same view." In 2007, Mary Dougherty and her family moved from St. Paul to the tiny Bayfield Peninsula, surrounded by the waters of Lake Superior and Chequamegon Bay in far northwestern Wisconsin. There they set out to live their lives against a backdrop of waterfalls, beaches, farm stands, and a quintessential small town of 487 people. Through recipes, stories, and photos, this book explores what it means to nourish a family and a community. As Mary Dougherty incorporates what is grown and raised in northern Wisconsin into her family’s favorite dishes, she continues a cultural tradition begun by immigrants hundreds of years ago. The result is a one-of-a-kind collection of globally and regionally inspired recipes featuring local cheeses, meats, and produce from the farmers in and around Bayfield—pho made with beef bones from a farm in Mellen, Indian meatballs with curry powder made in Washburn, chowder with corn and potatoes from a farm stand in Ashland. 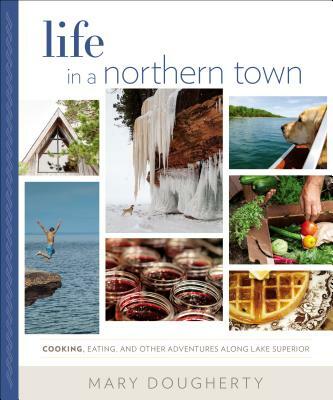 As she knits herself into the Bayfield community, Dougherty comes to more fully grasp the intricate relationship between food and community. After a sailing trip to Lake Superior and the Apostle Islands, Mary Dougherty transplanted her family of seven (plus four dogs) to Bayfield. She opened and co-ran Good Thyme Restaurant, recognized as one of the top dining experiences in northern Wisconsin, for four years. She went on to create the Cookery Maven blog and Words for Water, a photography project about the importance of fresh water. Founder of the nonprofit Farms Not Factories, she now serves on the board and is a rabble rouser for the Socially Responsible Agricultural Project. She was voted Wisconsin’s 2016 Progressive Leader of the Year. You can find Mary most mornings at the beach with her dogs and most nights in her kitchen cooking for family and friends.